This painting was finished just in time for the Western Federation of Watercolor Societies Exhibition entry. I met Judy Hoiness at the WSO conference at Eugene last spring, and shot reference for this painting at one of the breakout sessions she led. I love the way the light hits the side of her face as she demonstrates the water soluble paint sticks. The background pattern, inspired by the drapes, reminds me of the curls in her hair. 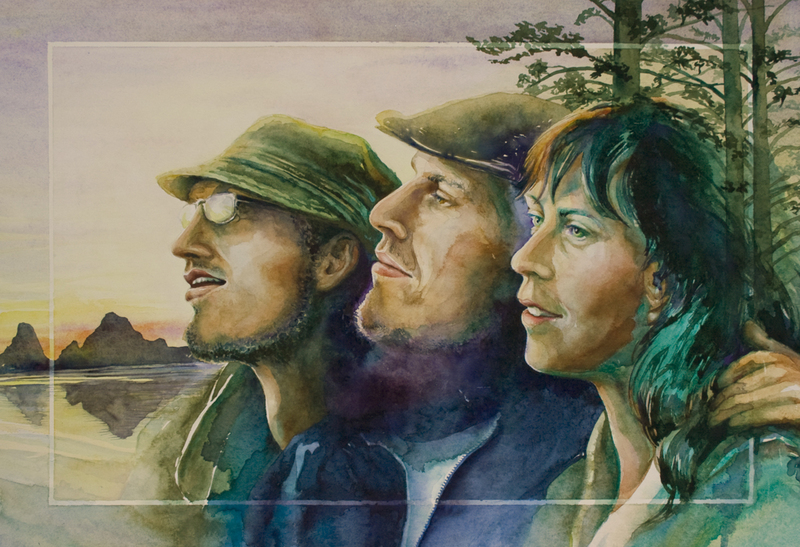 This piece showing my son Dane (center) with his two best friends (Dusty and Isabel) includes a 4-inch painted mat with the background seascape flowing to the edge. But since Western Fed requires a 3 1/2 inch white mat, I cropped several inches off the outer edge so it would look more like a liner mat. 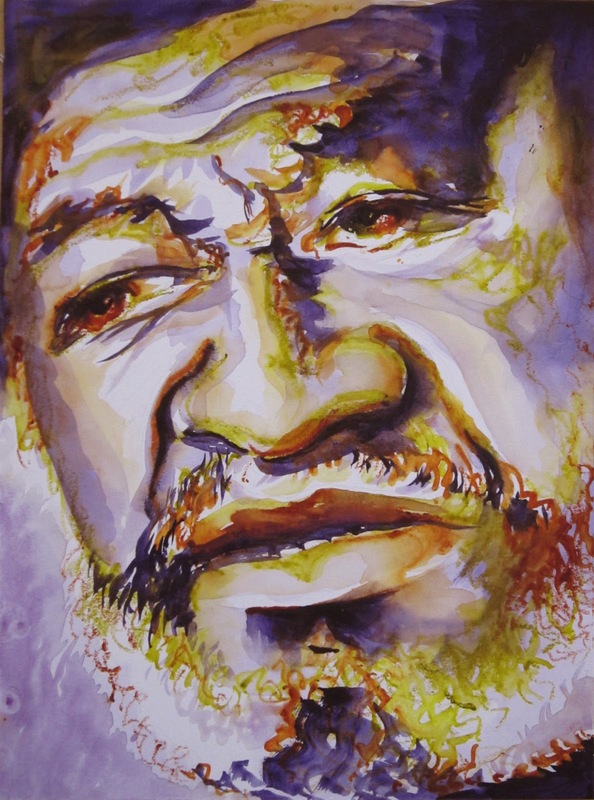 This is a quick study of artist and musician Mike Henderson from a video capture image as reference, using watercolor and DaVinci Watercolor Encaustics which are no longer on the market. I’m using a limited secondary color palette. An age old question arose as I contemplated how to use the birch Cradled Panels. Should I attach the paper before or after painting? If I paint first, I can toss anything I’m not fond of and not waste the panel. 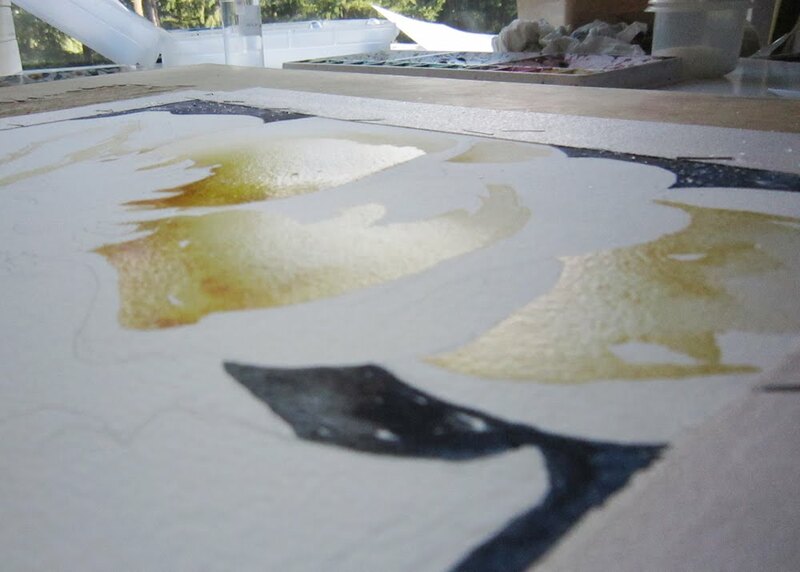 But if I adhere the paper first, it stays flat — no buckling while painting, even loaded with water. So I tried it both ways and found, as often is the case, there’s not one right answer. The good news is: either way works. Adhering first there’s no need to stretch, the paper stays perfectly flat as I paint. I can leave the edges as an overhang to protect the wood, cover the wood with painter’s tape, or both. Of course, that perfect balance between advance planning and spontaneity can be elusive. Painting before adhering to the panel does allow one to make decisions about the cradle later. I found using a larger cradle with exposed wood on the front face was a better look, overall. And stretching paper on a board for painting keeps the paper completely flat while working this way. This painting was started on a stretched piece of watercolor paper and transferred to the cradle after painting. 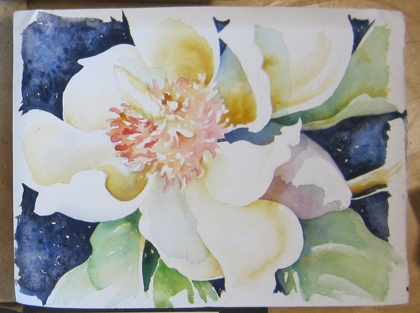 Here’s a similar painting of a magnolia blossom in progress, attached to panel first. You can see how it stays perfectly flat. Notice the paper extends beyond the cradle for easy trimming later. http://rene-art.com/wp-content/uploads/2011/11/magnoliastretched.jpg 229 320 Rene Eisenbart http://rene-art.com/wp-content/uploads/2016/03/RAE-logo4.png Rene Eisenbart2011-11-10 23:42:002016-03-17 20:18:35The Chicken or the Egg?